Stanley Martinez's first playoff action in the United States mimicked his terrific stateside debut. 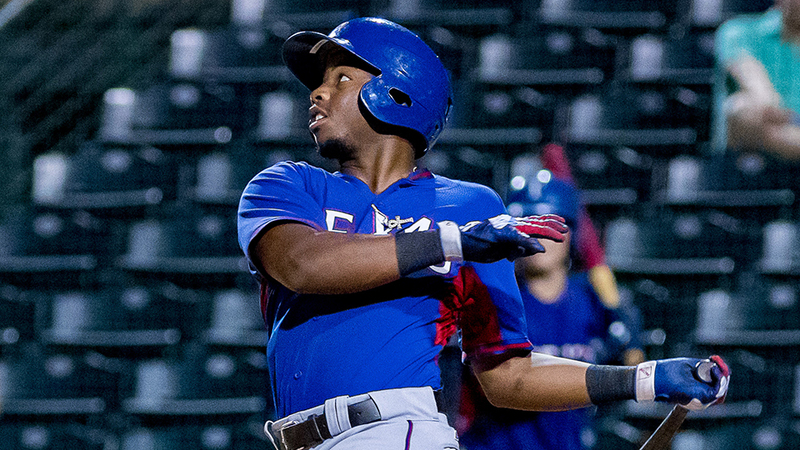 The first base prospect homered, singled and scored three times as the Rangers defeated the Indians 1, 7-4, in 12 innings to advance to the Arizona League semifinals on Tuesday night at Goodyear Ballpark. The teams combined for nine runs in extra innings after entering the 10th tied, 1-1. Martinez kicked off the scoring with a second-inning solo homer over the left field fence against starter Raymond Burgos. He struck out in the fourth and flied to center in the seventh but began the 10th on second base and scored on David Garcia's single to left. The 21-year-old reached on a bunt single and crossed the plate on Fernando Valdez's double in the Rangers' five-run 12th. Playing in the U.S. for the first time after three seasons in the Rookie-level Dominican Summer League, Martinez finished fourth on the circuit with a career-best .336 average while collecting 12 extra-base hits, 21 RBIs and 21 runs scored in 45 games. The native of the Dominican Republic began his professional career in 2015 as an 18-year-old and compiled a .265/.372/.394 slash line in the DSL. Beder Gutierrez gave the Rangers insurance with a two-run homer in the 12th. Rehabbing right-hander Chi Chi Gonzalez allowed an unearned run and one hit with one strikeout over four innings. Jesus Linarez was charged with an unearned run in the 10th and fanned seven over six frames. Dylan Bice (1-0) surrendered two runs -- one earned -- in two innings to earn the win. The Rangers will play the top-seeded Cubs in a one-game semifinal on Wednesday. Cristopher Cespedes doubled, singled and drove in a run for the Indians, while Miguel Jerez had a pair of RBIs. Burgos surrendered one run on two hits and a walk with a career-high 10 strikeouts in 5 2/3 innings. Jake Miednik (0-1) allowed five runs -- four earned -- on five hits with two strikeouts in 2 2/3 frames.